It's the most wonderful time of the year!! That it is! And I am so honored and excited to be participating as one of the style experts at this year's Holiday Spectacular at Bloomingdale's, The Mall at Millenia. This year is sure to be The Greatest Holiday yet! The event is tomorrow, Saturday December 9th. You can enter to win prizes, and there will be special gifts when you shop ready-to-wear that day. Plus while your dazzled in VIP treats and the latest fashions, be treated to some Holiday tunes by the Orlando Philharmonic Orchestra. You'll also be delighted by 3 local pop up vendors throughout the store, and make sure to stop by Women's dresses upstairs, where I'll be waiting with sweet Holiday treats, and you can shop my Favorite Holiday styles plus many Christmas gifting ideas! All event details are below. Can't wait to shop in Holiday Cheer with you there! I am so excited to share our home dressed to the 9's this Christmas! Disregard the construction next door! As many of you know, this is our first home, so we were super excited to deck it out for Christmas! I wanted to create a classic, romantic, whimsically enchanting wonderland and I think we did just that! It was so much fun scheming and dreaming about what to do with our holiday décor for our first Christmas in our home. However, this is that time of year when the pressure seems to get higher and things that should be exciting can seem to get quite overwhelming. My best advice to you all who feel me out there, would be to take a breath, keep things in perspective, and do what you love! Not what everyone else says you should do to decorate. You loose the fun in it when you decorate to live up to social media or other peoples standards. This year, I literally bought our tree when it went on sale early November, and decided to take my time with all the decorating to truly get the most out of everything. This allowed me to enjoy it more, and take my time with it all. Plus I get to enjoy my hard work and money spent longer than just four weeks. So I'm a classic girl. I've always loved southern style homes with big front porches, columns, red doors and black shutters. Being our home resembles a classic home, I wanted to keep it very classic and enchanting, while adding some whimsical charm, as that totally goes a long with our families personality. Here's how I achieved the look. Let's start with lights and garland. I went for simple white lights (The C-9 size in warm white from Ace Hardware), to give our house a sparkly glow. I ordered two battery operated, on timer, strands of warm white pre-lit garland to wrap around our entry stairway. I also ordered the best, least expensive, snow flocking spray can on amazon that I could find to lightly flock the garland (I didn't want it to be too white to blend in with the house). I'm really happy with how it turned out. Our neighbor taught us how to use fishing line to tie around the garland, which invisibly secured it to the railing. This gave us a nice frame to play with leading up to the front door. I also added red bows onto the Garland with the same velvet red ribbon I used on our front door urns and wreaths, from Grandin Road (The ribbon is a splurge but such high quality and doesn't bleed, so wellll worth it!). Plus it is luxurious Velvet, I mean come on! Next, on the stairs, the whimsical decor touches. I already had bought these lanterns on sale from pier 1, so I just took the candles out that I had in them for Fall, and filled each lantern with shatter proof red, white and green ornaments, which I bought one carton of on sale for $10 at Hobby Lobby! All their Christmas stuff is 50% off...such a steal! I purchased these "rice lights" on a silver wire from target, that are also battery operated on a timer, and put one strand in each lantern woven between the colorful ornaments to light them up at night. I found the small white flocked tree's on a bargain at Homegoods, which I used to create texture, contrast, and depth, staggered in between the black lanterns filled with colorful ornaments on the stairs. I finished the trees off with red bows, and the lantern hook with this harlequin print black and white ribbon (Purchased from Grandin Road), to tie in my Zoey front door Urns. Let's talk Planter Details with DIY Floral Arrangements. 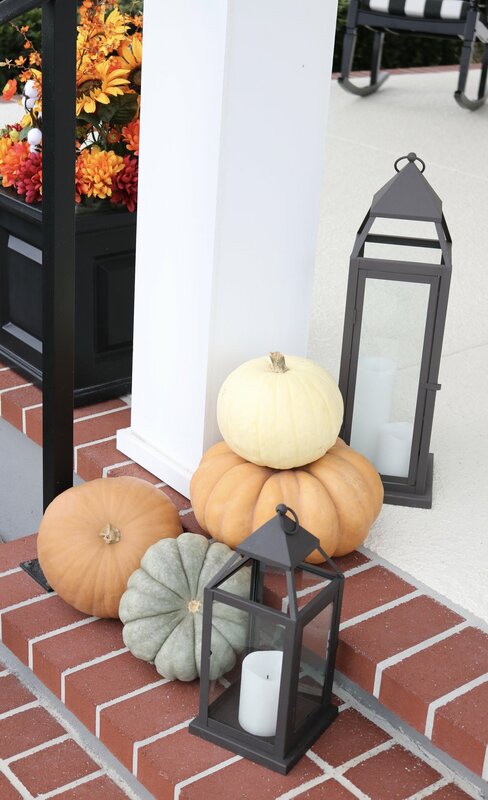 If you've seen my house before, you've seen my Zoey Urns at the front door, and black Nantucket planters, year round on my front porch. I just change out whats inside them with faux florals for each season. This saves me money each year as I store what I use each season in my garage. I created a whimsical winter wonderland with these planters by tying red ribbon around the bases of the Zoey urns, and filling the black planters with Snow flocked Pine, Poinsettias, Dahlias, Pine Cone and Faux Candy Cane Treats. I found this all at Hobby Lobby, again 50% off! And for the wreaths....quite possibly my favorite part. I've always dreamed of owning a white house with a red door, and hanging those super classic, festive Christmas wreaths on each window. Well dreams really do come true (just add snow please Santa!)! It feels like the American dream for sure, and I am sooo thankful for our beautiful home we worked so hard on! I found these 24" wreaths at Michaels for $6.99 a wreath with, I believe a 25% discount. I tied the velvet red Grandin Road Ribbon in a classic bow on each one. 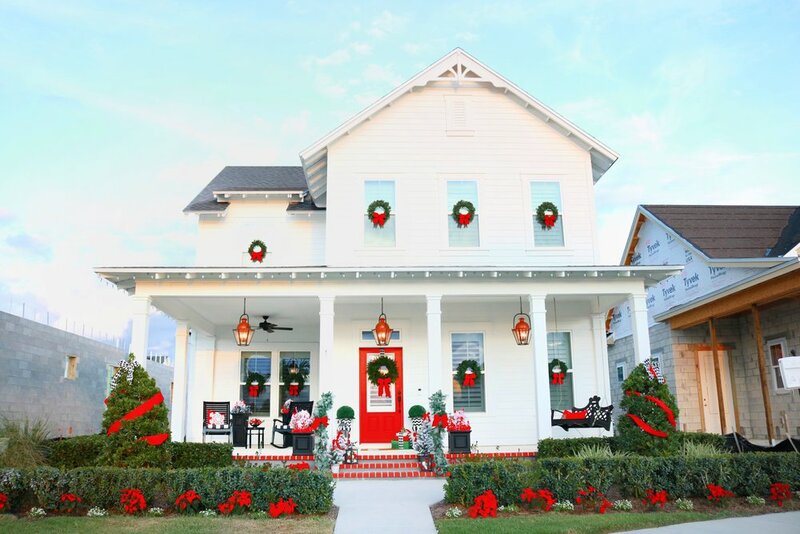 Here's how to hang the wreaths to make them appear floating in the middle of the window. Go to Home Depot or Lowe's and buy the command strip for outdoor windows (click here to see), follow the directions, and make sure to let them dry for an hour before hanging the wreath. They are water and weather resistant and have worked like a charm for us this year. I bought the large size in clear. Our front door wreath was a slight splurge from Grandin Road, Linked Here for you. It's pre-lit and also on a timer (thank God for timers these days!). Final touches include, poinsettias in the front yard, matching harlequin bows on the top of our two front yard trees, snowflake pillows I found at homegoods, an adorable snowman rug (keeping that whimsical charm up), and last but not least a red, white and green tier stack of faux presents by the front door, finished off with the same harlequin ribbon and a glam crystal mistletoe! Tip: put unused can items or a small bag of flour in boxes you've saved for the faux presents so they are weighted! Walaa, so there you have it! Our Whimsically Enchanting Winter Wonderland. A lot of work but I love doing it. It's like a creative outlet for me and It's so worth it to see the joy it brings to so many people's faces! Please feel free to share your feedback or ask questions in the comments below! 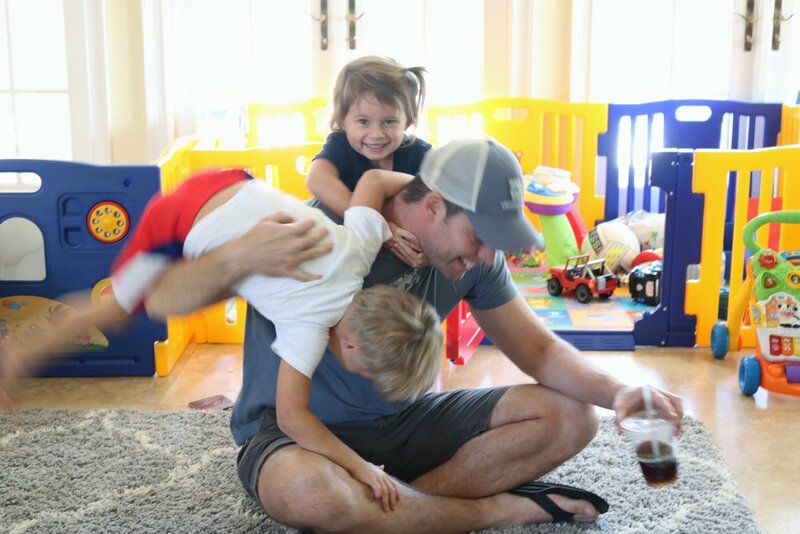 Love hearing from you guys! Merry Christmas and Happy Holidays! Hi Friends!! I can't believe its already December 5th today!! Where is the time going this year?! The older I get, the faster the time seems to fly! Anywhoo, I hope you all are having a joyous Holiday season so far, and are truly stopping to live in the moment amidst all of the hustle and bustle. This time of year can get crazy so that's something I am always struggling to work on. With all of the Holiday festivities, it's hard not to get caught up in it all. How I keep from getting too stressed this time of year is by being as organized as I possibly can, and making a plan (realizing that its not the end of the world if the plans change). I keep to do lists on my iPhone and make post it notes at the house. I delete the note or throw it away once I've completed the task. On to the Christmas Cheer now! There are so many parties this time of year, and this season is RED HOT! There are sooo many great Red dresses this year. The one I am wearing is from express and under $100. I am wearing a size 0. I've linked all outfit details for you to shop below, as well as some of my favorite red dresses! Happy Holidays!! I've rounded up all my favorites currently on my wish list, some in my shopping bag, for this years Black Friday and Cyber Week sales. Happy Shopping and feel free to reach out to me with a comment if you have any questions about the sale or fit/style of the item you're looking at! The Black Friday sales have already started on-line with Cyber Week so I am rounding up my personal favorites from each retailer for you from these amazing sales! See below widgets for my must haves, links to shop more direct from the retailer, and discount details from each store. Happy Shopping! Click here to shop all items or shop my favorites from the sale by clicking product images below! In the spirit of the Hostess with the Mostess, and being prepared for the Holiday season, I've launched my Holiday Shop on the blog, where you'll be getting frequent "Gift Guides", Holiday Home decorating inspiration, maybe some Christmas Fashionable Favorites, Party details and tasty recipes! I'm kicking things off with a toast to the Hostess with the Mostess! You ladies know who I'm talking about in your life who just, when it comes to Holiday entertaining, just seems to be perfection! She'll appreciate a thoughtful gift geared towards her savvy entertaining skills. Just click product images below to head straight to the web for purchase. I can't believe I am saying that Thanksgiving is already next week! If you're still searching for an easy recipe to make that will wow your friends and family, look no further. This recipe is so easy and tasty. I made it for some work colleagues since we had a team meeting this week and they absolutely loved it! The recipe says to use 8 mini loafs but I used 1 regular size loaf pan and it made 3 larger loafs instead of 8 minis. Also be sure if you buy this pan, to soften butter, use a pastry brush and brush it in every crevice, then sprinkle in flour to coat the pan so your bread easily comes out in the pattern (See photos below). Enjoy! On a side note, I am so thankful for all of you, and I hope you have an amazing Thanksgiving with your loved ones! I scooped this fabulous little number up entirely from Bloomingdale's, where the Fall Fashion styles are limitless. This was perfect for the Florida Fall weather we've been getting in waves. There is something about pairing over the knee boots with a little suede skirt for Fall. I just love the look! If you love it too, you can shop my outfit details in this post. Everything fits true to size, and the sweater is super comfy, not itchy (hate it when sweaters are itchy). At work I would pair this with a fitted black dress, tights and pumps, or a black pencil skirt, the top I am wearing and some pumps! The sleeves on my top are sheer with a dotted detail, making it super chic and dainty. At night I would pair the blouse with the blazer, some edy black skinny jeans, and the same pumps! Walaa, you've got your night out look polished to the T! 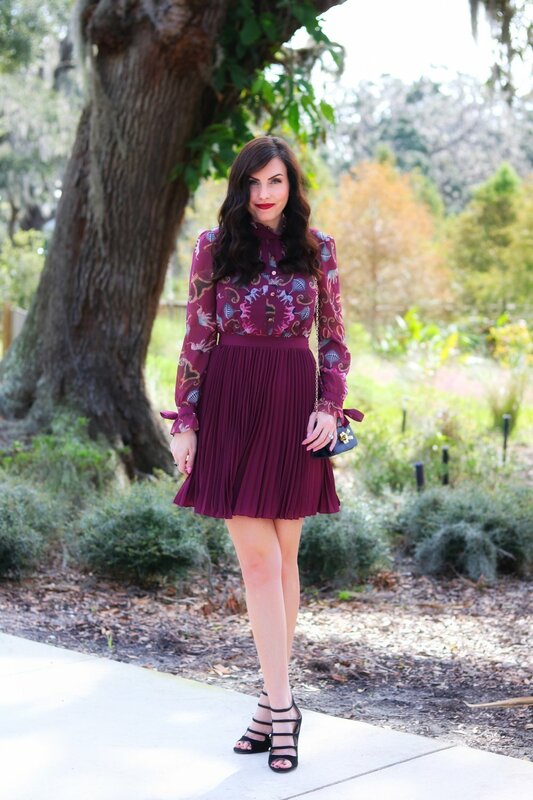 This whole look has that feminine flair that I love! Hi babes! Happy Friday! Today's Friday Fall Favorites is a sweet treat Friday pick me up! Nothing better than waking up to a warm cup of coffee in a festive mug. I'm ready to start the day...or in this case the weekend! 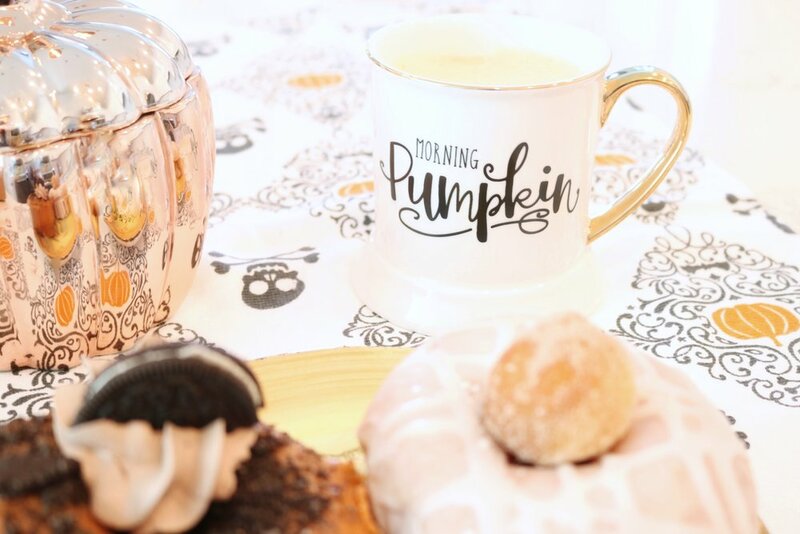 I'm sharing with you all details of the cutest coffee mugs of the season, including this "Morning Pumpkin" coffee mug! PS- I totally went to Starbucks yesterday morning for my first Caramel Brûlée latte of the season (my favorite one!) and their Christmas cups are already out! 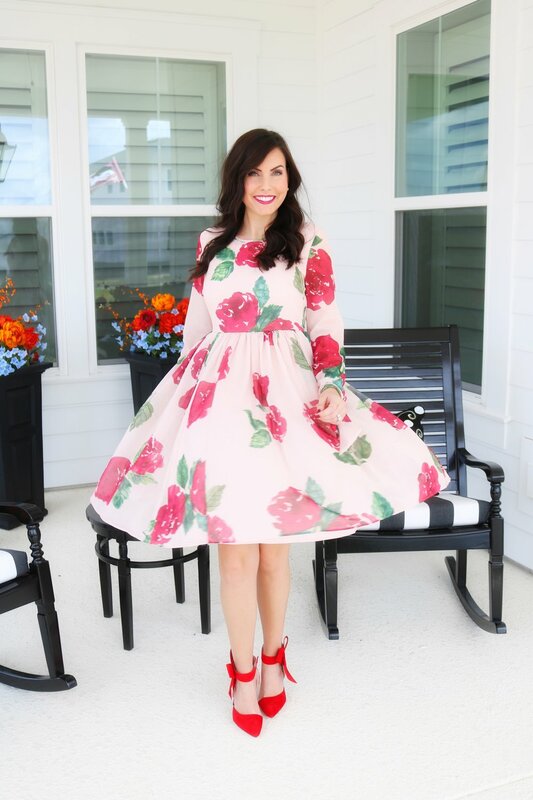 I loved last years because they were so classic and bright red, but this year they are super whimsical and cute! I am torn which ones I like better, but I am curious to hear your take on the cup designs this Holiday, so drop a comment or send me a message and let me know! Bring on all of the scented candles!! There's nothing I love more than walking into a home and instantly feeling like its Fall or Christmas time by the way the home smells. I have so many scented candles, my husband thinks I am a candle hoarder. Haha! But, they all just smell so good and I burn them practically every evening or rainy day. I'll find and buy them at Homegoods, boutiques, order online, from home catalogues...pretty much anywhere! But I will tell you there's nothing I hate more than when a candles wick doesn't burn properly or when the scent is a total let down and just doesn't fill the room or last. That's why lately I have been buying my scented candles at Bath and Body Works. They are a great size, 3 wicks, and the scents are sooo amazing. They last and fill the room making your home smell and feel like the Fall season! The only problem I have is there are soooo many scent choices I always struggle with which ones to choose. I've tried so many, so I am only linking my favorite ones that really give the room that Fall scent you're looking for that lasts. Unfortunately, one of my favorites (shown here-Cinnamon Spiced Vanilla), isn't showing up on line currently. However there are still plenty of good options left and they're always putting their candles on sell so keep checking back. I usually burn mine around my entryway of the home, the kitchen, and the living room. Happy Fall y'all! 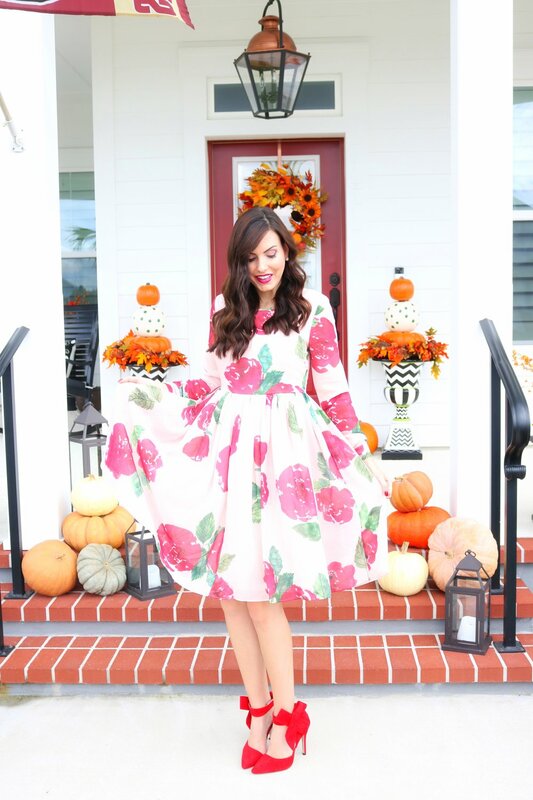 This may be my favvvoritte dress of the Fall Season. It will be worn on repeat to Church, brunch and social gatherings. I love the pinky blush background of it combined with the GORGEOUS Plum burgundy floral pattern all throughout it. The material is so light and fresh, perfect for just twirling around in. I feel so pretty in this dress, and sometimes truthfully all it takes is a cute new outfit like this to cheer me up! I've been super stressed lately with everything at work from the hurricane and loosing so much business during that two week time frame and then the damage at our house, so I needed something like this to make me feel good again. Does a new outfit cheer anyone else up? Fit is true to size, I'm 5'8 and around 115 lbs and I am wearing a size Small. The sleeve length and dress length are perfect. Cinches in nicely at the waist but still flowy enough to hide the bloating from all of the Delicious Holiday food I've been getting into! Happy New Year my Lovely Followers!! Wow, 2016 was incredible! I am so grateful for all that was blessed upon me this past year and everything I've worked hard for and achieved through dedication and perseverance. From achieving new major career milestones, to starting my dream, a fashion blog, and announcing on New Years Day that my Husband and I are building our first home and I'm starting a Home segment of the Blog! It has clearly been non stop, but in a fantastic way! Growing up there's always been one out of many bible verses that's always stuck out in my mind and is a constant reminder that you can do anything you put your mind to, is Phillipians 4:13. It was written on the gymnasium wall of the school I attended K5 through Eighth Grade and my parents pretty much started writing it in every card they gave me. It's a great verse to live by and so my husband and I decided to have it also read at our wedding, and recently wrote the verse behind the dry wall of the home we are building. :) So what are your goals to live by this year of 2017? I don't like to create "New Years Resolutions", just goals that I can incorporate in my daily life to try to improve and be the best that I can be. Here are a few of my 2017 Goals: 1. Get more in Shape to feel healthy and feel confident in a bikini while on the Presidents Club Trip I worked so hard for and will be on this year! 2. Start Cooking more healthy and tasty recipes at home. I'm hoping our new spacious kitchen will motivate me to do that! 3. Host our first Holiday Meal...and don't completely mess it up. 4. Win Presidents Club again this year and hold my #1 Regional spot. 5. Get Accepted into the Reward Style (Like To Know It) program for my fashion blog to make it much easier for you fashionistas to shop my fashion, travel, and home style. 6. Continue focusing on being more in the Moment and Enjoying Life. 7. Get to Paris!!!! 8. Go to church together more often to strengthen my relationship with Christ and my Husband. So in the spirit of accomplishing these goals and feeling fabulous while doing so, here is a fashionable new outfit to shop!!! Hello Lovelys!! I am literally still obsessing over this GORGEOUS Rachel Parcell Dress and Holiday Photos by the Lovely Katelynn Carlson. 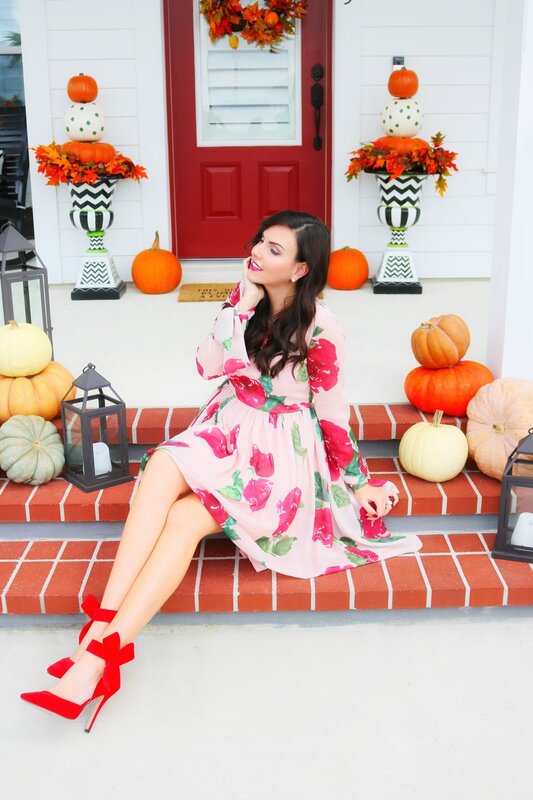 For those of you who may not be familiar, Rachel Parcell is a Beautiful Fashion Blogger, Wife, Mom of Two, and also now a clothing designer...GOALS (Who's with me?!)!! She has achieved Sophisticated Elegance with this timeless Bordeaux Lace Dress. I love how it cinches in at the waist to flatter the female figure, and falls slightly below the knees to keep it classic and conservative (Fits True To size- I am 5'8 and ordered a small). I just wore it for our Christmas Card Photo's (MORE TO COME FROM OUR CHRISTMAS CARD SWEETHEART SESSION SOON) and plan to wear it again for Christmas Eve Church Service. I think the length and sleeves make it very versatile to be able to wear to a Holiday Work Function, Christmas Eve Service, With family for Dinner, and to any of your New Year's Event's where you want to achieve a sophisticated, timeless, beautiful look, without showing too much or being too over the top. PS- Can you Believe Christmas is literally only 4 days away! ?